Makersan, manufacturer of sensors, engine throttle, and motion controllers, widens its product range manufactured at its integrated factory in Turkey. 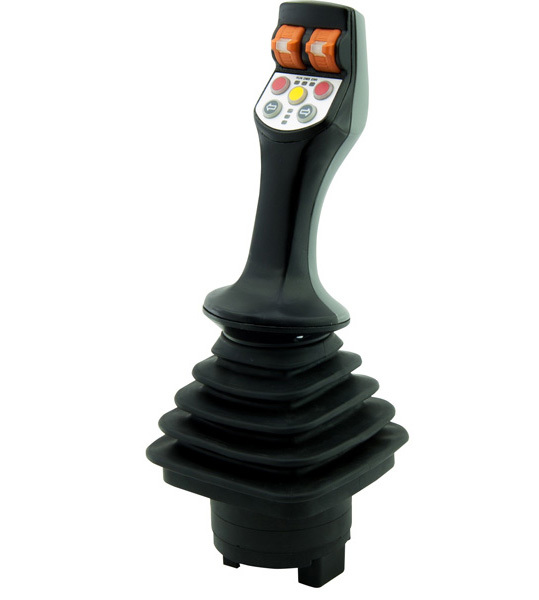 They added IP67-rated CAN joysticks with CANopen and J1939 support. In addition to it’s electronic pedals designed for harsh and demanding environment applications with CAN connectivity, the company also provides joysticks. The products provide configuration possibilities, using all buttons, switches, thumb rollers that Makersan has produced from contactless redundant hall effect technology. Furthermore the joystick can be fitted with an internal vibration and capacitive sensor. The push buttons can transform the grip into a feedback display. The pictured joystick is with a standard Makersan grip with freely configuration, built on the joystick’s base featuring CAN ability and IP67 protection level. The grip itself has been designed with the company’s thumb rollers, FNR switch, hall effect push buttons, and capacitive deadman switch.